John Boles, professor of Southern history at Rice University, spoke this week to a civic gathering about how to understand Thomas Jefferson. One of the most brilliant of American thinkers, Jefferson left no autobiography. But he did leave thousands of letters. Boles said Jefferson attended to correspondence every day and kept his own copies of the letters he wrote. His letters illuminate the man. John Boles received his doctorate of philosophy in history from the University of Virginia and has been a prolific scholar. He is always a thrilling speaker. The Teaching Company or some internet course should snag him to talk about Jefferson. 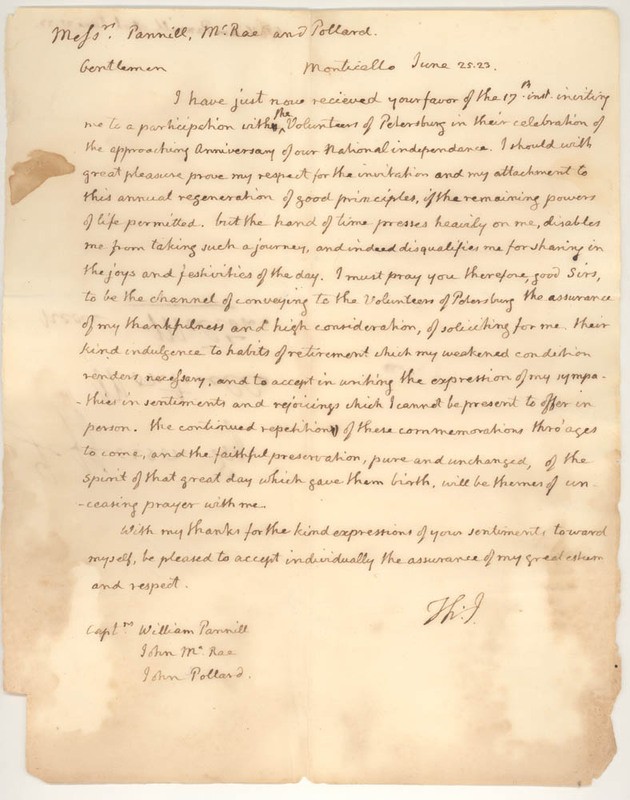 Jefferson’s letters are wonderful, Boles said. From them we can grasp Jefferson’s many interests: agriculture, natural history, government, music (he played the violin and kept a harpsichord at Monticello), art, and architecture. He wrote well – having created in a week the Declaration of Independence, one of the great documents of world history. He empathized with every reader, directing his letters to their interests. He would write to a farmer one day about methods of planting and to James Madison the next about the design of the new government. For a tiny footnote, I recently stumbled across a letter reproduced online that Jefferson had written to my forebear Captain William Pannill. This was William Pannill V, a resident of Petersburg, Virginia, most of his life. York, L. R. Hammersly & Co., 1900, pp. 80, 122)(Detroit: Gale Research Company reprint), as an ensign in the Tenth Infantry (2 July, 1813), p. 80, and then a third lieutenant in the same regiment (26 Jan., 1814), p. 122. The list shows no promotion to captain, so that may have been an honorary rank. Captain Pannill and two other young men of Petersburg wrote Jefferson in June 1823. They invited him to celebrate Fourth of July in Petersburg. Thomas Jefferson to William Pannill, et al. Messrs Pannill, McRae and Pollard. I have just now recieved [sic] your favor of the 17th inst[ant] inviting me to a participation with the Volunteers of Petersburg in their celebration of the approaching anniversary of our national independance [sic]. I should with great pleasure prove my respect for the invitation and my attachment to this annual regeneration of good principles, if the remaining powers of life permitted. but [sic] the hand of time presses heavily on me, disables me from taking such a journey, and indeed disqualifies me for sharing in the joys and festivities of the day. I must pray you therefore, good Sirs, to be the channel of conveying to the Volunteers of Petersburg the assurance of my thankfulness and high consideration, of soliciting for me their kind indulgence to habits of retirement which my weakened condition renders necessary, and to accept in writing the expression of my sympathies in sentiments and rejoicings which I cannot be present to offer in person. The continued repetition of these commemorations thro’ ages to come, and the faithful preservation, pure and unchanged, of the spirit of that great day which gave them birth, will be themes of unceasing prayer with me. With my thanks for the kind expressions of your sentiments toward myself, be pleased to accept individually the assurance of my great esteem and respect. This is a minor example of the Jefferson style. He must have received hundreds of invitations. Yet he elevated his correspondents by asking them to convey his message to the gathering. And he cast the message in the form of a prayer to remember why the Americans demanded independence. Boles said Jefferson believed the new American government, as a creature of the people instead of a monarch, would prove one of the great advances in history. Three years after this letter, Jefferson himself died on the Fourth of July, 1826. Postscript, February 10, 2013: I mailed Professor Boles a copy of the Jefferson letter. I had assumed that Jefferson had dictated this letter to an amanuensis. I saw Boles last week, and he said the document is in Jefferson’s own handwriting. It is graceful and easy to read. Boles said Jefferson would spend as much as three or four hours each morning replying to his correspondents in his own hand. I wonder what Jefferson would have thought of the decision no longer to teach cursive writing in elementary schools. February 15, 2019: In the meantime, Professor Boles has published a well-received new single-volume biography of Jefferson, entitled Jefferson: Architect of American Liberty (Basic Books). He relied on the voluminous new sources available.